Presco Brand Surveyors Roll Flagging is sold by the box. ONE BOX HAS 12 ROLLS. 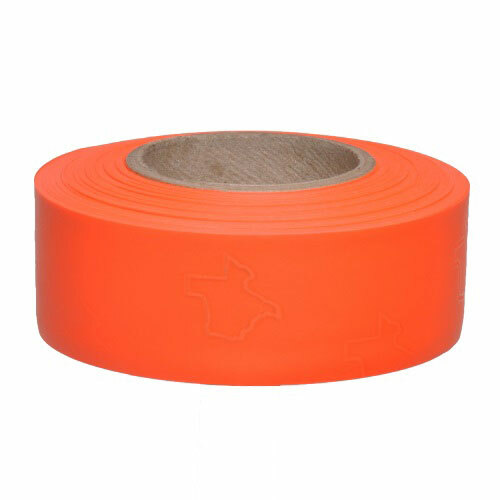 Well-known in the industry as "Texas Flagging", this Roll Flagging is colorful and highly visible. Also called Fluorescent Tape, or Marking Tape by some. Presco solid-color roll surveyors flagging is the most durable, longest-lasting outdoor roll flagging available anywhere thanks to proprietary formulations and annealing. Don't waste your money on cheap roll flagging that stretches, fades, and cracks. Presco Flagging has added plasticizers that yield maximum physical properties increasing tensile strength. Presco Roll Flagging is the most asked for flagging by industry professionals in land surveying, construction, forestry, logging, mining, geophysics, utilities, and oil exploration. This is the industry standard when it comes to roll flagging. Standard Colors each roll is 300 Feet long. PresGlo Colors each roll is 150 Feet Long. Surveyors Tip: Wrap wood stakes by using both hands wrapping in opposite directions, while stretching and over-lapping the flagging all at the same time. After tying a secure knot, some length is left over on the ends to make the flagged stake visible. The method makes for a very tight and durable flagged stake. The over-lapping and stretching avoids the flagging from loosening later and sliding down the stake. If done properly the flagging will be so tight it would need to be cut off of the stake using a knife or cutter of some type. This is not a knock off cheap product like other online stores well. This is the real "Texas Flagging" that we've used for years. Great product. Best flagging for the money.